You will need: 1250 g of dark red melange yarn Alta Moda Alpaca (90% alpaca, 5% merino wool, 5% polyamide, 140 m / 100g) Lana Grossa , circular needles No. 6. Nodular edge: 1st n. Of each p. shoot as individuals., last n. each p. knit like a person. 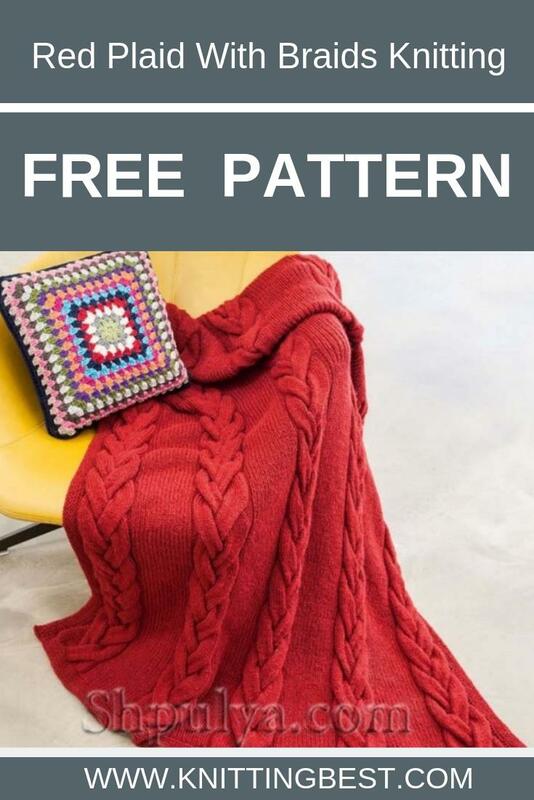 All items knit with nodular edges! Spit: knit according to the scheme, starting at 20 p. In the 3rd p. add 10 points = 30 points. Run 1 times the 1st –24th p., repeat the 5th – 24th p.
The density of knitting: gum: 20 p. X 25 p. = 10 x 10 cm. 30 p. Braids = 10.5 cm; garter stitch: 17 s. = 10 cm. 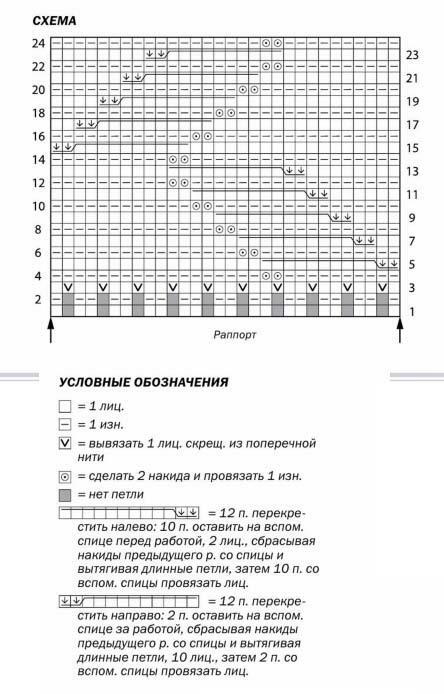 Description of knitting plaid with needles:dial 208 p. and svfzat 3.5 cm = 10 p. garter stitch, in the last row evenly add 32 p. (after the 8th p. add 1 p., then 31x1 p. after each 6th p.) = 240 p. Knit as follows: chrome., 3 p. . smoothing, 20 p. braids. * 3 n. smoothing, 27 p. gum starting and ending 1 person., 3 p. izn. smooth surface, 20 p. braids, repeat from * another 3 times = 159 p., 3 p. gdali, chrome. After the 3rd p. = 290 p. Tying in 404 p., In the last izn. R. over the braid loops nakida no longer perform. Through 162 cm = 404 p. from the strap knit over braids for 2 p. individuals. stitch, while in the 1st p. decrease by 10 points = 240 points, the rest of the pattern's tracks should be made according to the figure. After the 2nd p. individuals. ironing knit garter stitch, in the 1st r. evenly subtract 32 p. (11 and 12 p. to knit together persons., then 31 each of the 6th and 7th paragraph together persons.) = 208 p. At the height of the slat 305 cm = 10 p. loops free to close. On the circle. Knitting needles to dial on the longitudinal edges of 256 p. and knit garter stitch. After 305 cm = 10 p. loops free to close.